Mechanical vs. Electric Fans: Which is Best for Your Vehicle? Do I have the right fan for my cooling system needs? This post will cover all the fan options available for your ride. Mech anical fans rely on mechanical energy from the engine in order to operate properly. There are two main types of mechanical fans: clutch fans and flex fans. Clutch fans are controlled by a thermostat and utilize a clutch to engage or disengage the fan at a specified engine speed or temperature. However, the fan’s clutch never fully disengages—it keeps spinning at about 30 percent of the water pump speed at all times. The clutch also limits how fast the fan can spin and only turns the fan at a fraction of the water pump speed, depending on engine speed and temperature. Flex fans don’t use a clutch and therefore operate at 100 percent of water pump speed, making them more efficient than clutch fans. 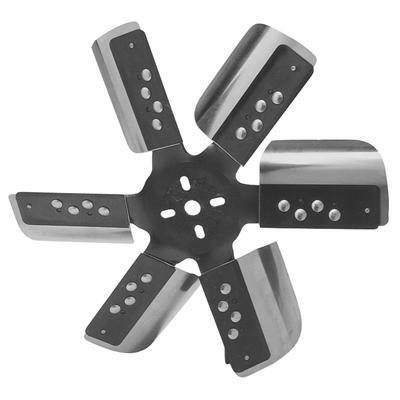 Considered a step up from clutch fans, these fans are typically lighter than clutch fans and often feature blades that flatten out at higher rpms for greater efficiency. 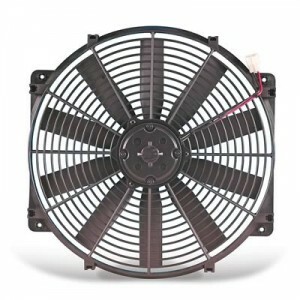 Mechanical fans, also called belt-driven fans, are an ideal choice for stock or mildly modified street vehicles, but they have some significant performance disadvantages. Mainly, mechanical fans cause parasitic horsepower loss because your engine expends a certain amount of power spinning your fan. This translates into power loss at the rear wheels. That’s why electric fans are typically the number one choice for more highly modified vehicles. As the name suggests, electric fans are powered by your vehicle’s electrical system. Although they will place an additional draw on the electrical system, they are a more efficient alternative to mechanical fans and don’t cause the dreaded parasitic horsepower loss. With no parasitic power loss and all the great benefits we mentioned above, electric fans have become the preferred choice for many performance enthusiasts. In a future post, we’ll show you the keys to choosing the right electric fan for your vehicle. Author: David Fuller David Fuller is OnAllCylinders' managing editor. During his 20-year career in the auto industry, he has covered a variety of races, shows, and industry events and has authored articles for multiple magazines. He has also partnered with mainstream and trade publications on a wide range of editorial projects. 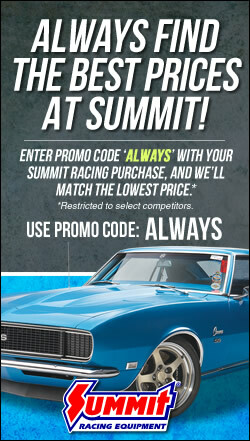 In 2012, he helped establish OnAllCylinders, where he enjoys covering all facets of hot rodding and racing. Greg, only you know what radiator you have in her, where you live regarding ambient temperatures, and what temperature it’s peaking at. This is a custom build, not as though someone familiar with it stock can tell you. That peak temperature, or higher still if you plan to tow with it or rob banks 😉 is going to determine whether what you have is adequate. First, why are you asking? Are you finding it overheating? People do get bored and just make a change for the sake of it, or solicit all kinds of advice asking ambiguous questions like “what’s BEST? ?”, but ultimately if what you have works, there is no sense in changing it. cant help but notice the lack of info. these guys give when asking these ???? Contrary to this article, an electric fan actually does give ‘parasitic power loss’. The engine has to give up power to the generator which powers the motor in the fan. It will actually take more power from the engine as this conversion from mechanical energy to electrical and back is much less efficient than driving a mechanical fan via a belt. While the electric fan is powered on it will zap horsepower more than the other types of fan mentioned – you just hope it’s switched off most of the time so it saves you fuel and noise – and if you’re obsessed with horsepower you hope it’s off when you’re putting your foot down. For some reason the article doesn’t mention the under-hood temperature which is affected by your choice of fan type – switching from a mechanical to an electric fan raises the temperature all around the engine bay as the cooling is only working when the water temperature is high. If you’re thinking of factors like ‘water pump reliability’ then surely fan reliability is also a factor; a mechanical fan bolted onto the water pump will normally only fail to do it’s job if the water pump fails. With an electric fan, the cooling system will also fail if the water pumps fails but it could also fail if the fail if the generator fails. Plus (and these are all about as likely as a water pump failure) it will also fail if the fan motor fails, if the cabling around the fan fails, if the connectors corrode or become unplugged, if the relay fails or becomes unplugged, or if the fan thermostat fails or becomes unplugged. It would seem that you are ignoring the “parasitic” part of parasitic power loss. A traditional mechanical fan spins either the hub or the whole thing all the time, even when the engine is cool enough that it doesn’t need the fan running. That load when no fan is needed is the parasitic component. The electric fan alternative allows zero power loss when a fan is not needed, or perhaps a few mA if an additional temperature sensing circuit is involved, a very tiny amount of power relative to the whole vehicle electrical system. It is not necessarily true that the conversion from mechanical to electrical and back is “much” less efficient because of the reason given above, plus that your alternator typically spins on a belt incurring that loss whether it is outputting power or not. You wrote that electric raises temperature all around engine back as cooling only works with water temperature is high, but that is a false logic because water temperature is a direct indicator of engine temperature with engine being the vast majority of heat in an engine bay, unless you happened to be on a long downhill slope with a trailer and laying on the brakes pretty severely. So far as fan reliability, usually a water pump does not outright fail but rather the bearing wears down till coolant weeps out so you have low coolant, and yet a mechanical fan is subject to the belt breaking or the bearing shot or the clutch shot. Generator failing is not an issue. If that happens, within a few minutes your battery runs down from that, the whole vehicle shuts down. A vehicle without a running engine generates very little heat. So far as listing other failure points such as connector or cabling, sure, but that is the nature of all the connectors and wiring in your vehicle. If electric fans were notoriously unreliable, they wouldn’t have shifted from a hot rod upgrade to a dominant position on modern OEM daily driver vehicle design. I think the bottom line is that if you find your current vehicle cooling system adequate, there is no reason to change it. If you do not find it adequate, there is only so much that can be done to a mechanical fan setup besides switching to, or adding in addition, an electric fan. This assumes you don’t have room for a larger radiator, or won’t open up the grill for a less restrictive flow which does very little to improve things in stop and go driving. It is often true that modified vehicles end up a little less reliable, whether it be going to an electric fan, adding a turbocharger, changing the suspension, etc. It depends on the details but for some applications the benefits outweigh the drawbacks. Remember it’s not as though the average lifespan of an electric fan is only a couple years. Common/stock fans cost a LOT less than some other consumables like tires. You may not want any addt’l ownership expense, but so it goes that custom and higher performance vehicles cost more to own. Thank you for this additional Information. This information was VERY helpful to the layman like myself. 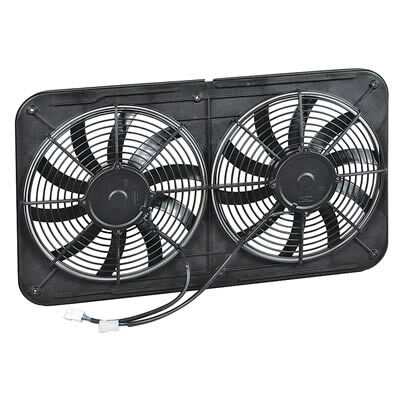 I am considering changing my 98 Jeep XJ to an electric fan (either custom for my jeep, or the Taurus fan). Do you have any thoughts on that? Hi i have a motorhome with 460cu.in. engine and i would like to HAD a electrical fan to the existing mecanical fan juste to help and reduce the amount of time the fan clutch come on to get a better fuel millage. It is theoretically possible, but you did not even mention the specific make and model of vehicle (! ), only you know what available space you have for an additional fan, probably a pusher in front of the radiator if there are no obstructions or whatever is an obstruction could be mounted in an alternate location. Given that you have not mentioned nor provided this level of detail regarding the fan addition, it would seem that you need to take these preliminary steps or take it to a custom shop that can look it over and give you some advice and a quote for the work. hi i have a 2001 m5 bmw and i was thinking about switching to an electric fan should I? Yes, you should absolutely put an electric fan in the M5 – Presumably you’re dying to make a mod of some type, so why not? You didn’t say why you’d want to…. Seriously, if your goal is to save gas, the modification probably isn’t worth the initial expense and trouble. If the M5 is running too hot, you need to find out why before starting with the mods. I have a 1990 Toyota/Winnebago w/ V6 3.0L. It, and almost all of these run warm-hot as they are hauling up to 11,000# . The engine and components are really stuffed into the engine compartment. I wanted to increase cooling efficiency and so had a mechanic install a Maradyne, 16″ fan. Wiring harness at 195 deg. Mechanic install sender into outlet hose from radiator w/ “T” adapter. Engine got hotter than ever. I researched and found that the sensor should be mounted on the inlet to the radiator from the engine cooling manifold. He vehemently disagrees and took the whole assembly off and reinstalled the clutch fan w/o discussing it w/ me. He and his employee argued in front of me to work on the electric fan or abandon it. After their debate the mechanic told me on the side that he really thought his employee was wrong and I should stay w/ the electric fan and he would figure out what was wrong. Only after the 2nd time I picked up the vehicle, “fixed” and running hot again, did I start to really research the installation. I found the vast majority of install instructions say to put sender at inlet to radiator, either on the manifold, in the hose (w/ a “T” adapter) or insert the probe into the radiator close to the inlet. I have had an ongoing debate w/ him about the location and also doing work and decisions w/o consulting me. I wouldn’t have him re-do the install but I do want to know what your opinion is about the sender placement. The radiator inlet is where the hottest water temperature will be found. Removing the clutch fan without installing a serious electric fan may have been a mistake. The fan should pull air through the rad and not push. Hey JT, if your stock cooling system is in good condition, then it should be able to handle the temps you’re describing. Since you’re not moving, airflow absolutely depends on the efficiency of your radiator and fan. Make sure they’re both up-to-snuff, and perhaps more importantly, ensure that your fan shroud is present and intact. I know the 4.2L in my CJ was really finicky about rising standstill temps until I fitted it with the proper fan shroud. I have a ’17 Silverado 2500hd 6.0l supercharged engine, and I pull a 13,000lb 5th wheel RV with it. I am going to install an electric fan set-up and was wondering what type of sensor set-up you think is the best. Do people ever install a kit with the coolant sensor and have an override toggle switch for extreme conditions? I just bought a 1993 GMC K3500 6.5 liter diesel. can I replace the mechanical fan with an electrical one?